Joe Watson sings ‘A Bushman’s Song’. This is a musical version of Banjo Paterson’s classic poem of the same name, however, it is better known as ‘Travelling Down The Castlereagh’. Paterson wrote this early on in his career. Presumably, he wanted to show some solidarity with bush workers who were already suffering at the hands of squatters who thought themselves king of the land. Joe called the song ‘The Old Jig Jog’. Recorded by Warren Fahey, Caringbah, NSW, 1974. Refer to my ‘articles’ section on the site and also Popular Entertainment in the Folklore of Sydney section, which includes background information and other examples of this tradition. The next period of folk song saw the emergence of what has become known as the ‘bush song’. In truth it had been around for a few years but in the period of pastoral growth, especially sheep and cattle breeding, this type of song became the dominant song form. 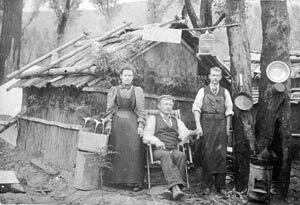 ” and, by all accounts, necessity led to all types of makeshift dwellings for the average bushman. Newspapers became wallpaper, empty jam tins became saucepans, shovels served as an impromptu frying pan, hats were used to strain drinking water, sugar bags became blankets and memories became firm friends. The story of Bob the Swagman and his trials and tribulations, not to mention his determination and optimism, has been one of the most endearing bush songs of all. And I’m forced to go on rations, in on old bark hut. And that’s one of the great misfortunes, in an old bark hut. And they all adorn the table of my old bark hut. For if I had one half as good I’d think myself serene. It was blown from off the rafters of that old bark hut. What’s out of sight is out of mind, in an old bark hut. There’s no fear of suffocation in an old bark hut. There’s a substitute for pepper in an old bark hut. ‘Tis useless cursing fleas and such in an old bark hut. And I thought the devil had me in the old bark hut. Just remember Bob the swagman, in his old bark hut. Anonymous. Collected from Mr Jacob Lollbach MBE, Grafton, by Warren Fahey in 1973. Mr Lollbach was a grand 102 when he recorded this full text of the song he had been singing for over eighty years. Mr Lollbach had learnt the song from a bullock driver, Jack Horner, who sang it to the tune of ‘The Wearing Of The Green’. Also included in Paterson’s Old Bush Songs, 1905 edition. Will Lawson, in Australian Bush Songs and Ballads, attributed this song to William Perrie adding “These verses were written in the shepherding days – when fences were few and far between – at Dungog, NSW. William Perrie was a veterinary surgeon in practice there.” Verses five, six and seven are from this version. For a detailed study of the bush song refer to my book (co-authored with Graham Seal) The Old Bush Songs, published Sydney July 2005 ABC Books.